Announcer: [00:00:00] The world is becoming a dangerous place for us women. Lipstick bodyguard looks just like an innocent little lipstick but it will instantly drop any attacker to his knees so you can get away unharmed. Lipstick Bodyguard… fear no evil. Get yours today only at LipstickBodyguard.com. 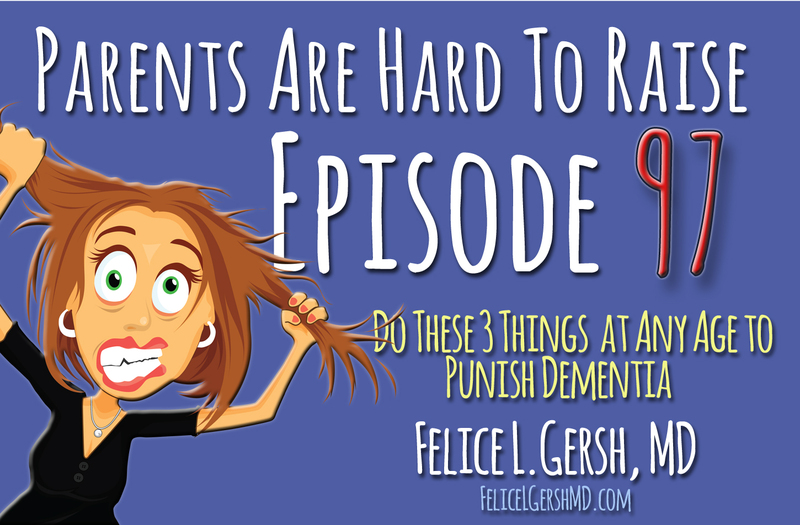 [00:00:24] This week on Parents Are Hard To Raise®, health and wellness expert Dr. Felice Gersh is back with more great advice to keep our aging parents and us living our lives to the fullest. [00:00:50] Join 180 million monthly subscribers who can now listen to Parents Are Hard To Raise® on Spotify. 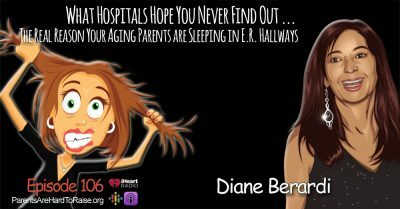 Diane Berardi: [00:01:08] Welcome to Parents Are Hard To Raise®… Helping Families grow old together without losing their minds. I’m elder care expert. Diane Berardi. 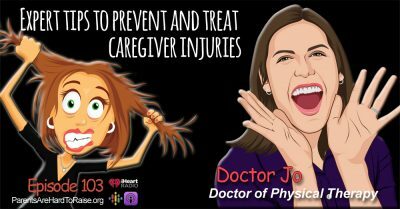 [00:01:18] Longtime listeners will recognize my next guest, mostly because she’s among my favorite guest medical experts. 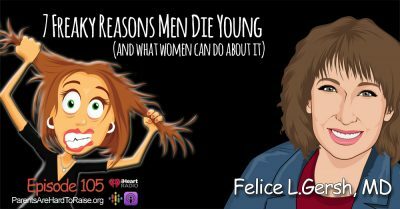 [00:01:24] Dr. Felice Gersh is a true pioneer in her field, a rare combination of an award winning physician double board certified both in OB-GYN and integrative medicine, and a tireless champion of women’s health. [00:01:38] She holds degrees from Princeton University, the University of Southern California School of Medicine and the University of Arizona School of Medicine. [00:01:48] Doctor Gersh serves as medical director of the integrative medical group of Irvine California. She also writes and speaks internationally on integrative medicine and women’s health. 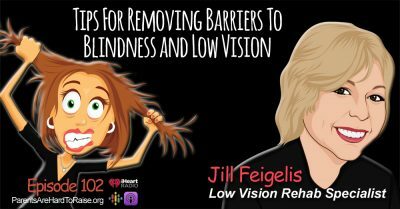 You can hear her weekly broadcast, A Healthy Perspective on KRLA Radio AM 870 in Los Angeles. [00:02:06] Felice… Welcome back to Parents Are Hard To Raise®. Dr. Felice Gersh: [00:02:09] I’m so happy to be back. It’s a wonderful honor and I’m just so happy to be with you and your entire audience. Diane Berardi: [00:02:16] Well we’re so happy to have you. You always are a wealth of information, so what do you want to talk about this week? Dr. Felice Gersh: [00:02:26] Well as most of you know, we haven’t a growing epidemic of dementia. It’s of course in this country it’s in the world. And it does impact women more than men. But of course men are also affected. Women experience Alzheimer’s at a rate almost three times the rate of men. Dr. Felice Gersh: [00:02:47] They do. And it’s really something that doesn’t get quite enough attention. But based on the way things are going and the fact that the population is aging we’re going to have really an avalanche of cases. I don’t know how we’re going to care for them. And plus who wants to live that life? You know we all want to live to not only be an older individual but also to have quality of life and without a functioning cognitively functioning brain, we’re not going to really get what we want. And right now it’s Alzheimer’s is the leading cause rather the sixth leading cause of death. And about five and half million Americans have already been diagnosed with it, and by the time a person gets to age 65 about 13 percent of the population is diagnosed with Alzheimer’s, and by 85 and above it gets up to 43 percent and even higher of course when you hit 90 it could be as high as half the population. So we really need to look at strategies. And the strategies have to start when you’re far younger than you know 80 and 90. There’s even things we can do at that age. That’s what I really you know. 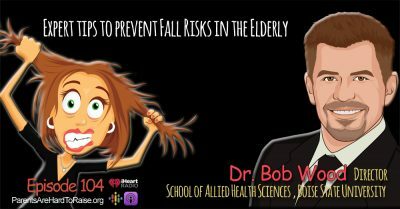 So depending on where you want to go we can talk about the earlier prevention, the early signs and what you could do it every single age to have a better functioning mind. Diane Berardi: [00:04:09] Yeah. What do we do at early age and at every stage? What do we do? Dr. Felice Gersh: [00:04:14] Well. Well the reality is that… Number one, our brains are part of our entire body. Long ago they started making this crazy separation you know mind and body are separate. And of course you know the psychiatric world was really separate from all other areas of health. [00:04:34] In fact, that’s not really that uncommon today is that you know psychiatric care is considered something very different from health care. But we now know that mood and cognition are very very linked. In fact, sometimes the earliest signs of cognitive dysfunction are mood disorders and also sleep. So sleep and cognition and mood are also very very very closely linked and sometimes the earliest signs of cognitive disorder manifest a sleep disorder. So we need to be alert to these all these inter linkages. [00:05:11] So if we’re going to care for our brain it really starts with caring for our bodies of course. And that means starting at a very young age feeding our bodies which includes our brains the proper foods. And it drives me crazy when I’m out, and I do a lot of traveling and speaking and I see people at every age eating things that I don’t even call food. I actually went to Dictionary.com and I looked at… What’s the definition of food? And it has to have nutrition; it has to be healthy and nutrient dense to really qualify as food. Otherwise it’s just something you put in your mouth, and something else, ’cause it needs a new name. [00:05:49] And so every single bite. So I have this rule you know no one should have to eat things that they don’t taste good. But everything that you eat you should enjoy but it has to be good for you. And I really hold to that. As you know with no exceptions just that everything you eat has to be good for you. And hopefully it’s something that you enjoy, because you need like such a variety of different types of nutrients: antioxidants and polyphenols from all kinds of vegetables, fruits, beans and lentils and and small amounts of healthy animals to really create a healthy body and a healthy mind. [00:06:27] And starting of course at the very youngest of ages when people are infants, you know, starting from even that point. Because we know that children now there’s an epidemic of different kinds of cognitive problems that they call ADHD. Right? And there’s so many children now on on amphetamines. This is like the sign from, you know, that we should pay attention to. And then at all ages we need to feed our minds the food that it needs. [00:06:52] And then it goes beyond just nutrition, because a lot of us lead very sedentary lives. It turns out that exercise is wonderful for the brain. In fact, there are studies that show that it’s better for depression than the anti depressant drugs. So and once again depression mood disorder, cognition… They’re all linked together. So exercise is great for the brain. [00:07:15] And we know that middle-aged hypertension is a well-known risk factor now for getting cognitive problems as you age. And that is too many things of course one of which is the vascular system, because you know you’ve got to have this wonderful highway of blood travelling all over the body and to the brain to feed oxygen and nutrients properly, and vascular dementia which is a different form of dementia, is very very prevalent as well. When you have unhealthy arteries everything that’s served in the body is served of by oxygen through the artery system. You know you’re not going to have the proper the proper function if you don’t get proper oxygenation and proper nutrients delivered. [00:07:57] So we need to work on blood pressure, but high blood pressure people need to know it’s really not an early sign of vascular disease it’s actually kind of a late sign. And one of the things that really dramatically lowers blood pressure is a combination of exercise and eating more vegetables. It’s amazing medicine, but every part of you including your brain. [00:08:19] And we know that eating you know berries and grapes and walnuts have amazing data to support them. So we and then we have to get to bed. [00:08:29] Most of us stay up too late. We know that the average American is getting not more than about six hours of sleep and that’s really insufficient for most people you really want to get at least six and a half, seven hours. You don’t have to have nine hours and you don’t even have to have eight but you definitely don’t want to have six and five and a half in five and such. Those are really taking away the time for your brain to heal itself. So we need to recognize the importance of going to bed. And then of course if you don’t sleep if you have insomnia the solution isn’t to take an Ambien or similar. They actually are associated with higher rates of dementia. Diane Berardi: [00:09:09] Oh my gosh! [00:09:41] And the other thing that’s wonderful to help people sleep is watching the sunset. There’s something really amazing about the colors of a sunset that helps that cortisol go down and the melatonin start to rise. That can help, and then little a little doses, small doses of melatonin can also be very helpful, because we do make less as we age and then we sleep poorly and so we need to see light in the morning make it dark at night. That helps to really get our circadian rhythm down. [00:10:13] And we know that dementia and mood disorders are very associated with problems with our circadian rhythm, our magical 24 hour rhythm the way every life form including humans have evolved to live in alignment a perfect beautiful alignment with the 24 hour rotation of Earth. And as we age, we sense we tend to get a little bit off kilter with our timing, and that in affect our cognitive function. [00:10:41] So it’s a lot to ask of people, right? You have to eat and exercise and sleep and then I didn’t even mention stress… Which of course stress takes such a toll on people’s minds and it ages them every you know every which way. So there is there’s so much that we have to do. Diane Berardi: [00:11:54] Right. Yeah. No, that’s true. Dr. Felice Gersh: [00:11:55] We know that there’s wonderful stuff that comes from the sun it’s not just Vitamin D, there’s other antioxidants that are made in our skin. And there’s something about the sun, just being out in the sunlight that makes people feel happy and feel good. [00:12:10] I know… just can’t get outside. See the sun. It’s wonderful for your spirit. And we know that like I said mood when people are sad, depressed you know they just it affects their cognition. So there is just a ton of stuff we can do when we’re younger. There’s no age that is too young to take care of your brain. And then the other is that there’s been a lot in the news. And yesterday we just had, I know we’re pre-recording this, we had the Super Bowl. There’s so much in the news about traumatic brain injury. So that’s another big topic. Diane Berardi: [00:12:47] And we’re going to continue… We’re talking to Dr. Felice Gersh. But first, I want to tell you something. If you’re a woman or there’s a woman in your life there’s something you absolutely need to know. [00:12:58] I want to tell you about my friend Katie. Katie is a nurse and she was attacked on her way home from work. She was totally taken by surprise. And although Katie is only 5 feet tall and 106 pounds she was easily able to drop her 6 foot 4, 250-pound attacker to his knees and get away unharmed. Announcer: [00:14:58] You’re listening to Parents Are Hard To Raise® now. Now, thanks to you… The Number one eldercare talk show on planet Earth. [00:15:05] Listen to this and other episodes on demand using the iHeart Radio app. iPhone users can listen on Apple podcasts and Android users on Google podcast. Alexa: [00:15:27] Getting the latest episode of Parents Are Hard To Raise®. Here it is for my iHeart radio. Announcer: [00:15:33] It’s as simple as that. Diane Berardi: [00:15:35] You’re right Dolly. There are so many really cool new ways to listen to our show, It’s hard to keep track. You can join the one hundred and eighty million listeners on Spotify. You can listen in your car, at the gym… Get exercise… Or pretty much anywhere on your smartphone with Apple podcasts and Google podcasts. You can get us an Apple TV, Direct TV, Roku. [00:15:57] And like Dolly said, you can even ask Alexa to play the show for you. It’s great because you don’t have to be tied to a radio anymore. You can listen when you want, where you want. For as long as you want. [00:16:09] And if you’re listening to the show in one of these new ways please do me a big favor. Share this new technology. Help someone else learn about the show and show them a new way to listen. [00:16:21] So Dr. Gersh, we were talking about the Super Bowl and traumatic brain injury. Dr. Felice Gersh: [00:16:28] Right. So it doesn’t have to be a concussion where somebody loses consciousness that can cause brain injury. We now know that lots of little repetitive injuries that are not even close to losing consciousness and ultimately take their toll on the brain. Diane Berardi: [00:17:15] Right. [laughing]. Dr. Felice Gersh: [00:17:16] So… You know, we do want to put helmets and guards and things protecting you know elbows and all those other parts when people are on skateboards and bicycles and things you know, to protect particularly the head of all parts, and skiing and so on. And now a lot of ski slopes requires things like helmets for children. And I think adults should be very careful as well. We know that every year there’s a few terrible tragedies and people have head injuries that we know even fatal from having not even what always seem like the worst case scenarios and yet they end up with hemorrhage into the head and so on. [00:17:51] So, you know, traumatic brain injuries can be subtle or very severe and sporting injuries and all kinds of ways that people get hit on the head. So we just have to be really aware of the importance of our brains and that they’re in these really hard skulls and if they as well they can’t really go anywhere. So it just puts pressure on them. [00:18:12] So you know brains are very different from what I was taught in medical school, which is… We were taught they could not feel. They were fixed for life. And now we know that there’s this amazing thing called neuroplasticity, where the brain can actually create new connections and grow and do amazing things that we didn’t even know could happen. [00:18:33] And that’s what we need to access to help people as they get older when they start showing signs of you know chronic brain fog, or get even diagnosed with something like mild cognitive impairment which can proceed into something as severe as true a full blown dementia. [00:18:52] So you know there are things that we can do, and recognizing that our brain does have this incredible healing property called neuroplasticity will allow us to really get a hold of these amazing tools that we have within our own bodies our own innate mechanisms and we can then create a better brain for ourselves. [00:19:13] So I can tell you a couple of different supplements that can be you know very helpful for everyone. [00:19:18] One of my ultimate favorites is it’s an Indian herb called Bacopa. [00:19:24] So Bacopa has been shown in several studies to improve cognition and also to be very anxiolytic, it reduces anxiety. What a great combination. [00:19:37] So sometimes they take Bacopa before I go up and they give a lecture, because I figure what the heck you know, if I could be smarter and calmer, What’s wrong with that? [laughing]. [00:19:45] And then so I do that, and one of my other favorites is called Rhodiola. [00:19:51] And that herb has also been shown to help you be smarter. They’ve had studies of students who take Rhodiola before they do testing and they score higher on tests. So that’s a pretty nice thing and it can give people more energy. So if you just if you have more like a sense of I don’t want to have anxiety, I feel kind of stressed and I want to feel calmer but I also want to be smarter, Bacopa would be your best choice. [00:20:17] If you say I’m really tired, I’m kind of sluggish, I need more energy and I want to be smarter then you go with the Rhodiola. You know that way you know you can you know access these amazing herbs that you know that work with our brains. [00:20:31] And then in general, just getting some antioxidants in. For example, you know but even like basic Vitamin C is a great one, and some of the other polyphenols like Resveratrol. Now resveratrol made it in the big news you know for a while. That’s found in a lot of things but particularly it got sort of famed for the skin of red grapes and wine. [00:20:56] But you know you have to drink like cases of wine to get it. So I’m not encouraging that. ‘Cause Alcohol is actually not good for your brain, so don’t do that. [00:21:05] But resveratrol is what we call a fasting mimetic. It actually mimics the benefits of a fast. Now it turns out that if you do a relatively short term fast what we call a periodic fast you don’t eat anything just have water for four days and this is not for your frail elderly. This is for you know relatively healthy people who are, say, in their 50s and maybe early 60s or younger like in their 40s 30s but not not frail elderly and frail people. But you know if you don’t eat anything for four days which I have never done because I get too hungry. But there is also out of USC’s Longevity Institute, they devised what’s called the fasting mimicking diet. Which they now created a company and they market as a type of food diet that they call Prolon for promoting longevity. [00:22:00] There is actually good data that it increases a growth factor in the brain called brain-derived neurotrophic factor (BDNF) which actually makes you smarter and actually makes you calmer. Diane Berardi: [00:23:22] That’s right. [laughing]. Dr. Felice Gersh: [00:23:22] You know… Close enough. I look you know like Mini, so it’s okay. Maybe not quite the ears, but close enough. [laughing] [00:23:30] So you know so I do recommend that to my own patient base who are looking to have you know we’ll say optimal aging, and for my very healthiest seniors the ones that are 65 and older who are really healthy under my supervision, to make and we do body composition. They always want to make sure no one is losing muscle mass. We cannot afford to do that as we get older. But all of my patients feel super smart and sharp when they when they do this kind of thing. [00:24:02] So… And most people know this, nobody really wants to eat and then do something really critically important. You know most of us would rather do something on kind of an empty stomach. No one wants to sit down and take you know the most important test of their lives. You know after eating a five course meal. Diane Berardi: [00:24:21] Right. That’s right. Dr. Felice Gersh: [00:24:22] I’d much rather feel sharper. And it’s amazing because when you don’t eat you get breakdown of fats you get these ketones separate, you know, breaking down in your body and being created, and that feeds the brain and you know there’s a lot of research being done on different what are called Nootropics. And they are for healthy longevity. [00:24:45] There are different kinds of supplements and NAD which is one of the Nicotinamide ribosides which help to create energy. So that’s something that is also there’s quite a bit of research coming out that it helps to create more energy and there’s one thing that a brain needs is plenty of energy. [00:25:04] And one of the other supplements that I usually recommend to help make energy is called Q10 or it’s derivative, which is called Ubiquinol, which is more absorbable. And helps… It’s a cofactor in creating energy. And you know one of the things that’s the difference between all people and young people is making energy. And that’s why you go to a park, the kids are running around like crazy and the old people are sitting on a bench. And it’s old people love sitting on a bench. They don’t have the energy to run around like the little kids, you know. [00:25:33] So anything that we can do to create greater energy in our brains is going to make our brains work better. So you know there’s this lot of interesting work on these Nootropics and using CoQ 10 and some of the antioxidants like Lipoic Acid and adding in some Carnitine which has helped with the transport of long chain fatty acids into the mitochondria to create energy so that the brain will have more energy. [00:25:59] And one of the other really wonderful supplements I think there’s nothing that Curcumin can’t do. Every time I turn around I read another article, Curcumin is good for everything. And it actually has helped with clearing some of the Beta Amyloid that accumulates in brains of Alzheimer’s patients. So there is another plus in the cap for curcumin. So there you have it. [00:26:22] I mean it’s like and we know that people in India, they had the lowest, because now things are different, because they eat too much American fast food… But in all the previous times the lowest incidence of Alzheimer’s in the world was in India, where they eat a lot of curcumin from Turmeric. Dr. Felice Gersh: [00:26:39] Yeah. [00:26:40] So, they think that may be part of their secret, for having such great brains. Diane Berardi: [00:26:45] How about… How about genetics in cognitive decline? Dr. Felice Gersh: [00:26:50] Well you know, that’s a very excellent question, because there is what sometime is called the “Alzheimer’s gene,” which is ApoE4. [00:26:58] Now so, ApoE is one of what we call a single nucleotide polymorphism. It’s a genetic thing. And so I hate when I use that expression. I don’t want to use it myself, “The Alzheimer’s Gene,” because it sounds like oh my gosh you’re going to get Alzheimer’s. Diane Berardi: [00:27:13] Right. Yeah. Dr. Felice Gersh: [00:27:14] It’s a pre disposition, but 25 percent of people carry that gene and it does increase the risk. But remember we’re talking about increasing risk. People who have two 4’s, they got one from each parent, they have the highest risk. But if we think about people in ancient times they weren’t really getting dementia even though they had the 4’s. And why is that? Because what really links to having a four is that they’re not as good at detoxifying the chemicals that we’re now living within our crazy environment. So if you make a conscious choice, if you have a four… And I do test people for it, because I think people should know their risk. Because it motivates people often to do the right thing. So but people should know whether you have the four or not everyone is at risk it’s just they have a higher risk. But if you eat organic food, if you really make it a priority, to get lots of vegetables, antioxidants, you avoid chemicals as much as you can, like cleaning solutions, makeup, personal care products, you get an air purifier. And I love by the way that there’s more and more data coming out about far infrared sauna for helping with many things including reducing risk of mood disorders, dementia, sleeping problems… And they all linked to cardiovascular and brain… Everything’s interlinked. [00:28:39] So, but anything you can do to lower what you call we call the “toxic load,” the total environmental toxic load in your body will lower your risk of getting dementia. And we know that people with the 4 gene the so-called “Alzheimer’s gene” their ability to get rid of toxins in their bodies is not as they’re not as proficient. But so we want to lower the load and then we want to increase our bodies capabilities by fostering a healthy gut, healthy liver by not drinking a lot of alcohol, by eating all the healthy foods that support the healthy gut microbes and by eating in a timed way, so that you stop snacking all the time, that you eat like a big good breakfast and then you eat like a medium lunch in a small diner you know that old adage. And not snack. And if you have a snack, make it a snack of fat like some olives or some avocado. Things that will not raise your insulin and not raise your protein intake and don’t trigger all the nutrient sensors in the body that change the whole paradigm of how the body works. [00:29:48] So try to eat in a timed way. Try to do some fasting, like I talked about. Try to eat lots of antioxidants, polyphenols and your genes will not become your destiny. And that’s what I emphasize over and over… When you have a certain genetic propensity that is not your destiny. [00:30:08] And it’s really so important as a take home message, that it’s not destiny. And everyone has risk and it’s just what they were pointing out, you have just happened to have more risk. And the other thing that’s really wonderful to point out is that there are also survival advantages with the Alzheimer’s gene…So It’s not all bad. Diane Berardi: [00:30:29] Doctor Gersh… Of Course we’ve run out of time again. I mean you create such interesting shows for us. How can people reach you? Dr. Felice Gersh: [00:30:39] Well I have a real brick and mortar practice in Irvine California. People who actually want to see me in person it’s called the Integrative Medical Group of Irvine. And my Web site for lots of information and blogs and videos is, FeliceLGershMD.com. [00:30:57] And there are there’s lots of articles and posts that I think people would find interesting. So they can connect with me as, either as a real patient or just as an interested party. Diane Berardi: [00:31:07] Thank you so much. This was such a great show. [00:31:11] I love getting your e-mails and questions so please keep sending them in. 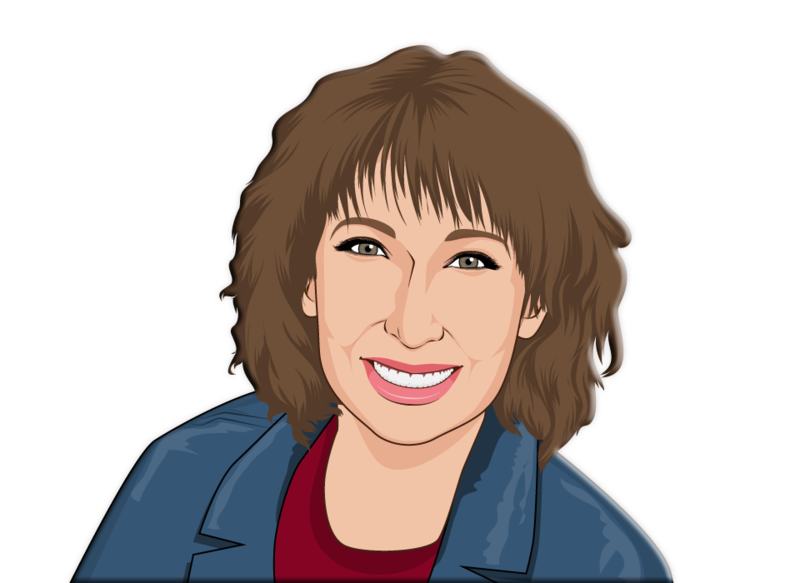 You can reach me at Diane@ParentsAreHardToRaise.org or just click the green button on our home page. [00:31:20] Parents Are Hard To Raise® is a CounterThink media production. The music used in this broadcast was managed by Cosmo Music, New York, New York. [00:31:28] Our New York producer is Joshua Green. Our broadcast engineer is Well Gambino and from our London studios, the melodic voice of our announcer, Miss Dolly D.
[00:31:37] Thank you so much for listening. Till next time… May you forget everything you don’t want to remember and remember every you don’t want to forget. See you again next week!